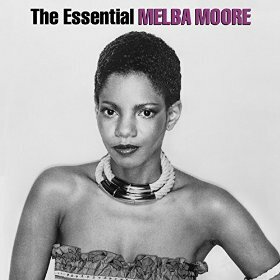 Depending on what page you turn to in the story of Melba Moore, you might get a completely different impression of the artist. Turn to the mid-'60s and you'll find her backing up Dionne Warwick and Aretha Franklin. Towards the end of that decade, she's replacing Diane Keaton in Hair, and a few years later she's taking home a Best Supporting Actress Tony Award for her role of Lutibelle in Purlie. Signed to Mercury then Buddah, Melba Moore is garnering club play by the late-'70s with hits like "You Stepped Into My Life" and "Pick Me Up, I'll Dance." Fast forward to the R&B charts in the middle of the 1980's and her name is liberally dotting the page while also surfacing on the ballot for a Grammy nomination: "Best Rock (yes, you read correct) Performance, Female" for "Read My Lips." Turn the television on and there she is on her sitcom, Melba and appearing in the Ellis Island (1984) miniseries. At the dawn of the 1990's, she's rebounding from welfare only to emerge as a successful gospel artist while revisiting her stage roots in Les Miserables, Chicago, and her one one-woman show, Sweet Songs of the Soul (now titled Still Standing). The one constant throughout all of these different chapters is Melba Moore's scale-defying voice. Celebrating nearly five decades of performing and recording, Melba Moore radiates passion for what she does and appears as energetic and engaged with her craft now as nearly 45-years ago. Her most recent foray into the recording studio is a duet project on Shanachie with Phil Perry, The Gift of Love. Featuring a batch of beloved soul classics and two new songs, the album unites a pair of powerful icons while attesting to the impressive longevity of Melba Moore. The Gift of Love is far from the only project Moore has in the works. From revamping Still Standing to vetting film projects to her partnership with a soul food restaurant in Harlem (Gospel Uptown) to finishing up her autobiography, there's hardly a stone left to turn. While awaiting the official release of The Gift of Love, Melba Moore offered some insight to what force guides her through both the rewarding and challenging aspects of performing after all of these years. With an infectious laugh and disarming candor, the shear presence of Melba Moore is a gift unto itself. I know you live right across the water in New Jersey. How do you feel when you see the New York skyline? I have the best view of New York. I have the whole skyline. The view never gets tiresome. It's always awesome, whatever the weather is. I can't believe that all those buildings were put up there brick by brick, by people like us. I've been here about 10 years so I've seen the skyline change quite a bit, especially with 9-11. I commute to New York all the time. I do everything in Manhattan because it's so convenient. It's miraculous, really. The skyline is amazing. I see that you're performing at Joe's Pub in New York on September 14 at a benefit featuring the cast members of Hair. What would you say is one of your fondest memories about performing in Hair? That's a hard one because there are so many. I just remember being...of course when I first started, it was very shocking because I was what I call a "black American princess" - very middle class, upwardly mobile, well educated, structured. Probably in my heart, because I am an artist, I'm more of a black militant than middle class. The ability to get into Hair and be part of a revolution was something that I adjusted to quite easily. Do you think that kind of dynamic could exist in the same kind of way today? No. It's a totally different environment. I'm watching the news and I'm hearing people from government saying yes we know 90% of the people don't want this process but we're going to vote for what we want to. It's like the government is committing anarchy and the people at these town meetings are speaking out, but they're not being heard. That speaks to me of a crisis. There has to be concentration and there has to be movement towards what people feel America is about because that's what we did (in the '60s). We felt like, "We're supposed to be a nation of peace, of love and we don't want our boys sent off to fight those wars." That's what it was about. I think that environment is existing right now but I don't think it's taking the same shape or form. How do the lyrics of "Easy to Be Hard" (from Hair) resonate today? In Hair, it was a young person telling a young man who she's in love with, "You take my feelings for granted and you treat me with no respect." Whenever I do "Easy to Be Hard"...first of all it's a beautiful song. If you listen to the lyrics, basically it says that you can't preach about being a good person. You got to show it. You got to act it. The song is personal and it's communal. The audience takes it as an inspirational message. When I say "Ronnie Dyson," what comes to mind? My pal, Ronnie! When he came into Hair, he was still a teenager. He was a baby, but we were pals. I loved Ronnie. He had a beautiful, beautiful voice. I remember him doing a parody like he was Diana Ross. I just remember him being funny, playing and joking all the time. Ronnie was always doing something to make everybody laugh. If he was just with you, then you would make you laugh. I never saw him angry. How would you describe Lutibelle to someone who had never seen Purlie? (Laughs) Okay, well first of all she was adorable. She was pretty, she was cute but she was funny-looking too! She was a young, black, country Lucille Ball. (laughs) I think of Lucy as so pretty and so cute but just crazy. When I came into the show and I auditioned for the part, I read for the part but I never sang for the part. I think it was Joyce Brown, the conductor, who kept telling Philip Rose, the director, "You know this kid can really sing. You should really hear her sing." He said, "I'm not worried about that. Just make sure she can carry the part." He was kind of traditional, old-school Broadway -- "If you speak the words in the song, that's fine. As long as you're a great actor." The one song that I had which was the title song, "Purlie," I did it by myself but it was kind of like a little parody with Aunt Missy. It kept stopping the show. I was doing the song like I do and I like to scream. For me it was crazy to have that voice and not use it. I did it in the title song and they said, "Wait a minute...." Then they gave me "I Got Love"! What do you remember about the night you took home the Tony for Purlie? I remember going to the party afterwards. I don't remember a lot of it. It was too exciting for me. I have to go back and watch the tape. I was so scared because I remember the lights being on in the theater. That was shocking to me. I think I looked over and saw Pearl Bailey and Lauren Bacall. I remember that they had called somebody else's first name and my last name so I thought I didn't get it. I remember being completely confused. I know I took the Tony Award home because I got it here with me! It was excitement, 1,000 times over! What's interesting to me about your career, and what I've always admired about you, is your versatility because you are able to traverse so many different styles, whether it's stage or pop or R&B or disco or gospel. To me, what I look for the most in a performer is how well they can adapt to different styles. What has your experience been like in the industry being so versatile? Has it been something that's worked for you or has it been a challenge? All of the above! I think what happens is, it gives you opportunities where you find them. The reason I'm stronger in gospel now is because I was a Born Again Christian with no music and no career. I was praising God and going to church everyday and I'm saying, "God, you made me a singer and I ain't got no song!" He said, "Well you're in church, sing!" I started to learn how to sing gospel. I sing it a lot better than I did. Describe the process of how you honed that particular style. I was in the congregation. I would listen to songs that I liked and then as I learned them, I would ask for permission to sing them in worship. I would take that song and keep singing it until I got really good at it and then I would add another song to my repertoire until after awhile I had enough songs to do a gospel CD. I had to make a living at that because I didn't have a career. I learned how to book myself, I learned how to build my prosperity according to Christian principles, according to the Bible, moving with that group of people until I got enough money to pay for my own CD to be produced. That's basically my base. I'm able, now, to branch out from there and do whatever God gives me the ability to do. When you sing gospel music, what do you feel as opposed to singing a pop song? Heaven and earth and all eternity are available to me to make me my best and make me understand the portion of my inheritance, which is the Kingdom of Heaven. There's more power now, there's more energy. There's more substance, there's more innocence, there's more range. Whatever God is, there's more of it! If you had an opportunity to speak with aspiring artists, what would you tell them about the music industry? It's a fabulous industry. I think it's very tumultuous and very difficult because it's very powerful. The secret is to figure out what is the real purpose of it? If you want to get in there, how will you get in there and what is going to be your real goal and your real destiny? It's wide-open. It's not a crap shoot if you can figure out what the order is and follow it, you'll win. It's hard to imagine that it's more open than it was. It's more available to you without having to go to three or four major companies. You can go direct. You've explored a lot of different outlets for your talent. What was the inception behind your one-woman show, Sweet Songs of the Soul? I had no work. It had been shut down. I looked at icons like Cher, Whoopi Goldberg, and Lily Tomlin and many others. Basically you start with what you know. I wasn't a playwright so you have to learn how to do that. The original title was Sentenced to Sing, for all I had to go through just to sing a doggone song! As it continued to evolve, the title now is Still Standing. It's still evolving. Now we're showcasing it for Tony Award and Pulitzer Prize-winning writers to polish it up and finish it for me because I think I've taken it as far as it can go. How did The Gift of Love come together with Phil Perry? David Nathan and Preston Glass initiated the project. They brought it to me and we were supposed to do it with another artist and he fell out of it. They took it to Shanachie Records. Randall Glass and Daniel Weiss are the head executives and they said, "Would she consider doing it with Phil Perry?" I said, "What?" I never heard any of his music from Shanachie but I know Phil Perry and he's a phenomenal singer. I said, "Please, would he do an album with me?" (laughs). The way it grew is that we both loved and respected each other's music from a fair distance. Our paths have crossed but we don't really know each other. We had to spend time with each other and get to know each other. It's like a romance when it first starts. You're putting your best foot forward but we're also trying to let each other know who we are. It's like you meet, you're engaged, and all of a sudden, you're married (laughs)! I know I am, and I'm sure Phil is too, very sensitive to the fact that each of us is bringing to the table a lifetime of hard work and challenges so you don't want to take it lightly. I'm working with their producers and their executives. They've worked with each other before but I haven't. Regardless of how they feel about me, I feel like the new fellow on the street coming in. My point is this, everybody does what they think and they hope is going to be good for each other. They played it back and we were shocked because it sounds like we've been working together for years! With two exceptions, I think, all of the other songs have been done before. They're cover songs. "The Gift of Love" is an original song and there's another song that I do on there called "We'll Be Together Again" and that's an original song. Phil and I have to bring our personalities together on "The Gift of Love" but I think of the whole album, that is the epitome of what our chemistry is. It's the message we want to give. The one song that I've heard so far is your cover of "You're All I Need to Get By." I'd be curious to know, as a singer, what is special about an Ashford & Simpson melody. (Laughs) That's a great question for you to ask me particularly because Nick and Val started me in the industry. My first experiences were singing back-up with them. I know Val's personality and her voice very well and then I got to know her style of writing and it's very unorthodox. The way the song starts, it starts with the background (sings opening line of "You're All I Need to Get By"). It has the drama and the emotion in the rhythm of the lyrics. It's a peculiar gift the way that they sing and write. I don't even know if you can explain it. There's something about Valerie's chord changes that are inspirational, from her church background. She's genius. She's always been a great entrepreneur. She's also worked with the best arrangers. I remember Marvin and Tammi's songs had these inspirational-type chord changes. I say "inspirational" because they're not necessarily church-type but they are inspirational. Preston Glass did the arrangement on "You're All I Need to Get By." Listen to the way the strings and the chord changes start. The harmonies are so lush and beautiful and magnetic. You're in before it even starts! That's a great gift and a great talent. It's one that's complete from the drum beat to the bassline to the chord changes to the message and the melody. There are all these different things in there that make it whole. It's very genius and yet it's very simple. By the time Phil starts singing the first lyrics, you already love the song. That's called knowing how to write things! Speaking of inspirational, your life is inspirational and I know that you've endured a lot of challenges. What do you think is the key to your longevity? How have you survived? I stay in God's faith. That's my job now. You could call it a ministry. I give Him the first part of my day and then the last part of my day and He tells me what he wants the rest of the day to be like. I always win if I keep doing it that way...and anybody else who chooses to do it that way! One of the most talented and versatile performers of the last 40 years, Melba Moore has carved an impressive legacy on Broadway, television and radio. A unique combination of beauty and talent, Moore began her career as a backing vocalist for such artists and Ashford & Simpson, Aretha Franklin and Dionne Warwick. Her big break came when she was offered a leading role in the Broadway production of the musical Hair. She was superb in the role, and opened the door for a generation of African American females on Broadway. Her performance in Hair resulted in other prime roles, including leads in Purlie (for which she won a Tony Award), Les Miserables, and Your Arm's Too Short to Box With God. Her national star began to rise in the 70s, as she arrived on CBS with the Summer replacement series The Melba Moore Show. She also became a successful recording artist, scoring a top 5 hit with her first release, "I Am His Lady." As the late 70s arrived, Moore capitalized on the burgeoning disco market, landing a big hit with a cover of the Bee Gees' "You Stepped Into My Life" as well as McFadden & Whitehead's "Standing Right Here." In the early 80s, Moore continued to work with McFadden, but moved to a more sophisticated, adult sound on her recordings, landing her first #1, the great cut "Falling," along with the hit "Read My Lips" and the smash duet with Freddie Jackson, "A Little Bit More." A series of devastating personal and financial setbacks in the late 80s knocked Moore out of the spotlight and the entertainment world, and she was virtually unheard of for nearly a decade. She reemerged in the mid 90s, taking roles in a number of traveling Soul and Gospel music plays, including her autobiographical Sweet Songs of the Soul, and touring with Cissy Houston, Shirley Caesar and other Gospel greats. She also recorded a Gospel album and made a critically acclaimed performance in the Gospel-comedy film The Fighting Temptations. Her "comeback" culminated in 2004 with the release of the CD Nobody But Jesus. Since its release, Moore has appeared in a number of stageplays as well as her own one-woman show, Melba Moore: Sweet Songs of the Soul. In early 2009, Moore signed with Shanachie Records to record an album of duets with Phil Perry.